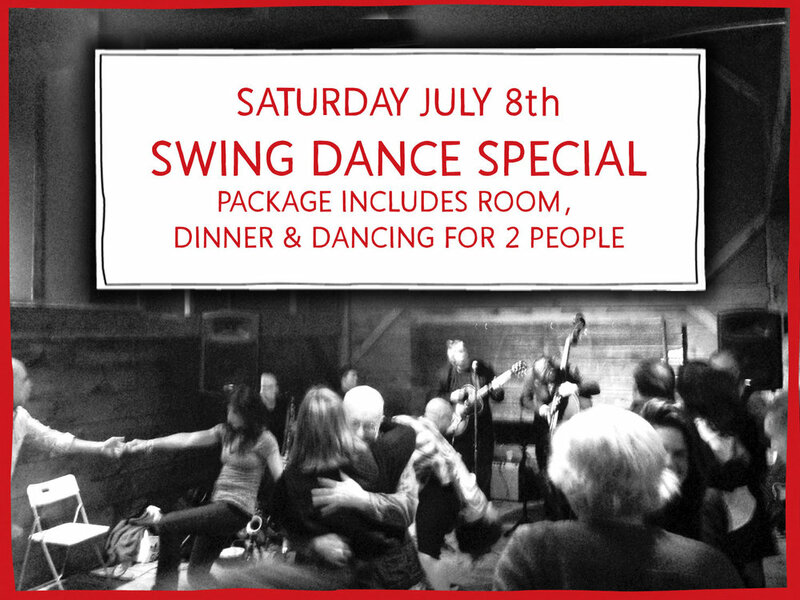 Come spend the night with us, Saturday July 8th, while you dance just down the road from Race Brook Lodge in Sheffield, at Dewey Hall for another epic Swing Dance Night. Swing the night away to the dulcet tunes of One Straw Revolution: Bobby MacVeety, guitar & vocals | Roger Suters, bass | Jon Suters, guitar | Grisha Alexiev, percussion | Peter McEachern, trombone. Call (413) 229-2916 or email info@rblodge.com to book now! Come to dance or just enjoy the night in a beautiful hall with some great music, a snack, and a drink. This event is part of our Second Saturday Swing series at Dewey Hall. Each month we have a beginner swing dance lesson followed by a live band.